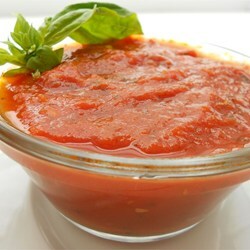 This easy-to-make healthy marinara sauce can be served with pasta, meatballs, chicken, or fish. Cook onions until translucent. Add remaining ingredients and simmer for 15 minutes, mixing gently. Let cool and refrigerate.